If you have a number of sites that relate to each other you can group them. 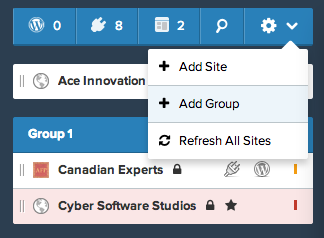 Click on the + button and then select Add Group. You can then name your new group. The group will appear under the site list. To add a site to the group, hover over the icon on the left hand side of the site name until the cross cursor appears. You can then click and drag the site into the group box. Hovering on the name tab of the group box will display two icons. The settings icon allows you to edit the group name or delete the group. The refresh icon will refresh the sites in the group list. 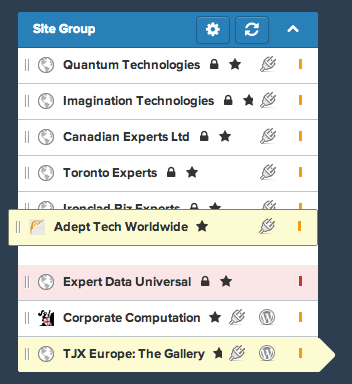 The up and down arrow on the name tab of the group box toggles between the full list of sites in the group being displayed or hidden.